Wonder what stocks and shares are? If you want stocks and shares explained simply in plain English then read on! First of all, shares and stock are different words but in the stock market world, they often mean the same thing. For example you could say “I have shares in Microsoft ” or “I have stock in Microsoft”. Therefore if you see stock and share used it is important not to get confused as they both often mean the same thing. Shares are issued by a company to raise money (capital) to help plan for future projects or because the owner/s of the company want a big lump sum of money for themselves as a reward for the hard work they have put into building up the company! 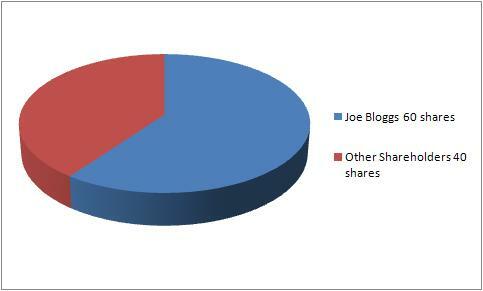 Joe Bloggs owns 100% of Company A (for arguments sake we’ll say he owns all 100/100 shares of company A). He then issues shares for his company and decides to sell 40% of the company (40 shares). As you can see by the pie chart below Mr Bloggs now owns only 60% of the company meaning he still owns the company (over 50%) and therefore still gets to make the company’s strategic decisions. Note: Mr Bloggs will now only receive 60% of the future profits when the company’s dividends are paid. So you ask “why has Mr Bloggs done this?”. The reason is that by putting a portion of the company up for sale he would have received a major lump sum of money when people bought the remaining 40% of shares in his company. This money could allow him to grow the business or he could even keep the money for himself to buy a mansion in southern France! Why should the public buy shares offered by company A? The public would buy the shares in order to reap some of the future profits made by the company. They would receive these profits in the form of dividends. but that’s not the only reason! The public could also make money by a rise in the price of each share. This is called a capital gain on their stock. Jane Doe sells her 20 shares for $18 each. That’s means she collects $360. As a result earning herself a tidy profit of $160 or 80%! There are two types of shares, ordinary shares (also known as “common stock”) and preferred shares. Ordinary shares are the most common type of shares and carry flexible dividends (dividends that are adjusted in accordance to a company’s profit), these shares also carry full voting rights. Preferred shares have fixed dividends, which must be paid before any dividends are paid to ordinary shareholders. However preferred shares carry no voting rights. It is important to note that when dealing with shares in the stock market as we know it, you will nearly always be dealing with ordinary shares (common stock) and its not an issue you should worry about! Learn more about the stock market by taking an online class at Udemy. Practice buying and selling real shares yourself, via CFD’s, using plus500‘s welcome €25/£20 bonus…see if you can trade as well as the professionals! Free to sign up here. Please note your capital may be at risk if you fund your account with real money. Why not check out some more reasons to buy shares. Find out why trading shares is less risky when using stop losses. i would like to buy shares in a company im living in london do i have to do it through my bank? or online? The easiest way would be to open a brokerage account. In the UK spread betting is the cheapest way to trade shares. However by betting you will not own the share and therefore you will not receive dividends. If a share is transfered to a third party can it be redeemed? Akaluese – Yes it can – shares are transferred to third parties as standard practice in the markets. For example, your brokerage holds shares on your behalf. More importantly, every time you buy and sell shares, they are changing ownership from one party to another. quick question. if i own shares in a company, and the company keeps growing, these shares i own will not profit me except i sell them to someone for higher than what i bought it for? i other words, as a shareholder, my only profit will be selling of my shares when it is smart and when it will benefit my pocket? The company you own shares in may also pay its shareholders a dividend. So in sort, you can make money in 2 ways, through dividends and capital gains. i have a demat account in bank but i havent dealt with any share trading for last 4-5 months. do i still need a brokerage account? Prashant – A demat (dematerialized) account will basically allow you to convert paper shares into electronic form, but it won’t really allow you to trade (buy and sell) various stocks. So if your goal is to buy and sell other stocks, you would also need a brokerage account. Danny – That’s great and it makes me happy if we inspired you to invest. There aren’t many rules of right and wrong – you have to decide on your personal goals and risk tolerances. There are thousands of companies in the market that might be expected to do very well, but it’s how they do relative to analyst and investor expectations that usually impacts stocks in the short term. In other words, if it’s a company that makes widgets, maybe they sold 10 million of them and they were actually expected to sell 10.5 million. They still did really well, but not as well as expected. On the flip side, if they surpass expectations or grow faster than expected, then you can see even more appreciation of a stock. But remember than events and surprises can always occur, so your money is always at risk. You must decide if your goal is a quick profit or longer-term growth and must evaluate the investments and timeframes that are right for you and your investment objectives. If I own 30% in a company and decide to sell it, how much will it worth? How do I calculate to determine how much should I get or sell it for? Barney – The answer to your question is essentially the same as it would be for owning 30% of anything at all. If you own 30% of a house, and the house is worth $500K, the value of your share would be 30% x 500K = $60K. Is is effectively the same with a business. You own 30% of the total value of that business, so once you know the total value, you can calculate 30% of that total value. However, remember that the value of anything at all is always only as much as another party is willing to pay for it. So even if you think something is worth a certain amount, you still have to have a buyer interested in paying that amount. If you have no buyers who want to pay that amount, it will be worth less. If you have a lot of buyers interested, it could even sell for more than it’s actual or face value. Some companies could not paid dividend on their shares why? Hi Aina – Not many companies choose to pay dividends on their shares. Most companies choose to reinvest that money into further growing their business. It’s a strategic choice that a company makes in deciding which they believe will add more value for shareholders. i work for one of the biggest companies in the world, every month I buy shares and the company give me the same amount for free. At present I buy approx 8 shares every month and the company give me 8. The company employ hundreds of thousands of people all around the world who get the same type of deal with their contracts of work, my question is and this may sound very stupid but I’m new to this, where do the shares come from? How is it possible for hundreds of thousands of employees to keep buying these shares every month. Surely the company has a value and a limit on its shares, it seems to me that they have an infinit amount of shares to sell. hope someone can help. ??? Hi Chris – When companies go public and issue shares, there are restricted shares and float. The restricted shares are basically set aside for company employees and officers, and the float are the shares which the public may trade. If you look at Apple, you can see that there are 5.87 BILLION shares. So, even if your company had a few thousand employees and had a billion restricted shares, there would be plenty of shares for employees for a very long time. More importantly, the shareholders can vote to authorize more shares and more shares can be issued for employees if needed. So me and my friends are doing something called “Young Enterprise” and we are suppossed to sell shares. How many shares should we make? 1000? 100? What would be a good number to start with? Hi Thomas – Well, since you are apparently just doing a simulation of selling shares, it’s really going to be arbitrary. I don’t know the details of your stock market simulation so I’m not sure how to advise you. If you create more shares, it probably becomes more realistic. I don’t know what type of tracking of shares you are seeking to do. Perhaps you can track your shares using a spreadsheet. Hi. I’m getting interested in investment, from reading Rich Dad, but I have no idea how or were to buy shares, nor were to look for shares to analyze the price, grow history, and dividend payment amoun/times per year, (I don’t know if I should analyse anything else). Could you please tell me about this, and where to buy? Also from a previous questions, i didn’t quite understand something about me not owning the share I buy, but something/someone called “brokerage” (that I also didn’t understand what it is), and for that reason don’t getting the dividend payment that this brokerage would be earning instead of me (me who would be the share buyer). Could you please explain this to me? When you buy shares, you would be the owner. I use either google finance or yahoo finance as a starting point for evaluating the basics of shares. The details you ask about like growth history and dividend history are all there. When you buy the shares through a brokerage, you most definitely do own them and will be paid the dividends. The brokerage simply acts on your behalf to take care of the transactions for you and obtain the shares for you or sell the shares for you. They also collect the dividends for you an deposit those dividends into your account. For what you are seeking, it sounds like Ameritrade or Scottrade would be good options for you. Take a look at that page and see what you think.